Help Kitty “quality test” carpets in the carpet factory by shredding as many as you possibly can! Collect coins and diamonds to unlock various kitties and dress them up in amazing ways! 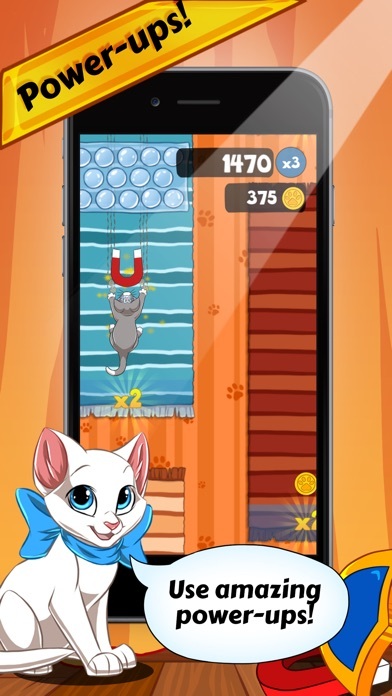 SIMPLE MECHANICS ◉ Just swipe to the right to jump! Jump between carpets to shred them all! ◉ Pop Bubble Wraps and Dash down the carpets for bonus points! ◉ Pick up Power-ups to help you on your way! CUSTOMIZATIONS ◉ Buy hats for swagger and power-up boosts! 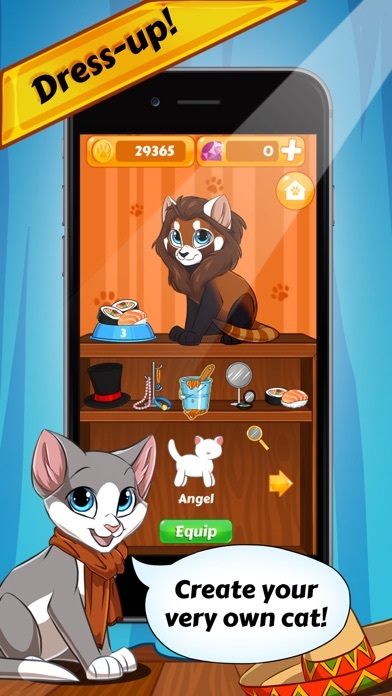 ◉ Unlock different kitties to fit your own personal style! 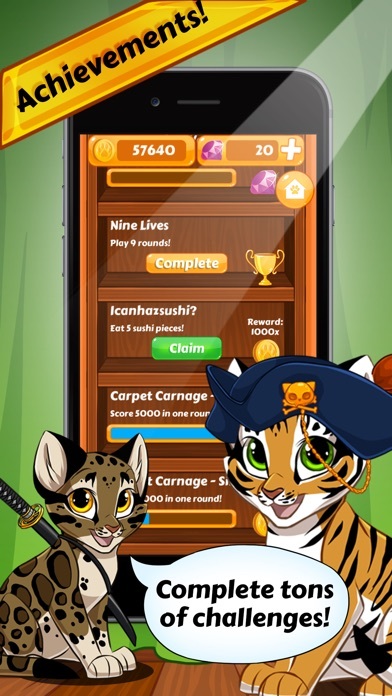 ◉ Master the art and become a Carpet Kitty Master! ACHIEVEMENTS ◉ Complete challenges and receive great rewards! DAILY REWARDS ◉ Open the Mystery Box every day to receive free premium gifts! Love the art style. The white screen thing is too freaking long. Why? Plus get rid of the ads but I guess not the ones where you watch to earn free coins. Plus you also need to fix the controls. When I swipe down to make the cat go faster, it thinks that I swiped right when I didn't. Other then the long white screen pause I love this game. I also enjoy the fact that you can earn plenty of coins to spoil the little rascal lol. Like I said that white screen is a killer lol I get anxiety because I enjoy the game so much and want to play it immidiately, can you please see if you can shorten the pause a bit? Thank You!! #carpetkitty!! Straight to the point, the white screens you get from the game over are too long. I don't want to sit for 20 seconds to play the next game. And lag will most likely auto fall you so please try and fix that. The graphics is not bad, but the idea is old, nothing new. Cute little game. It's fun in short spurts. The play mechanics are simple, yet entertaining. Collecting coins for different accessories keeps the game interesting. 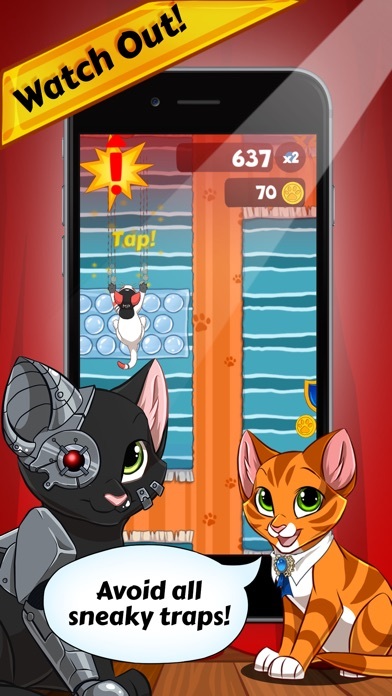 Thanks Appsolute Games for a meowingly nice game. Your advertising strategy is predatory in my opinion. It ruins the gameplay.